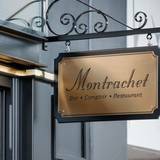 Come and experience Montrachet's Private Dining, for a business lunch or a special occasion. We welcome you to our 18 seat private room with a selection of menus designed by Shannon Kellam accompanied with a premium and rare wine list. Make yourself feel at home.Our warm, classic bistro style dining room if perfect for family events, romantic dinners and corporate lunches over a nice bottle of Burgundy. Please fill in your information below and Clare Kellam will contact you as soon as possible to book your event. If you’d prefer to talk now, please call us at (07) 3367 0030.